Last year my father passed away and so this Father's Day will be the first one where he isn't sitting in The Chair. Actually, last year he probably sat mostly in his wheel chair since The Chair was somewhat difficult to get in and out of by then. But he was still with us and could have occupied The Chair if he so chose. But this year it's an Empty Chair. And that feels a bit weird. My dad always had The Chair, though it appeared in several guises through the years. But it was always a recliner, and always leather -- or in the earlier days, when he wasn't earning a lot, Naugahyde. Some of my earliest memories are of him sitting in The (fake leather) Chair giving me a sip of his Coke out of a huge, icy glass. None of us boys (there are three of us) ever sat in The Chair, unless we were deliberately provoking him to see what he'd do. It was quite definitely a symbol of authority. 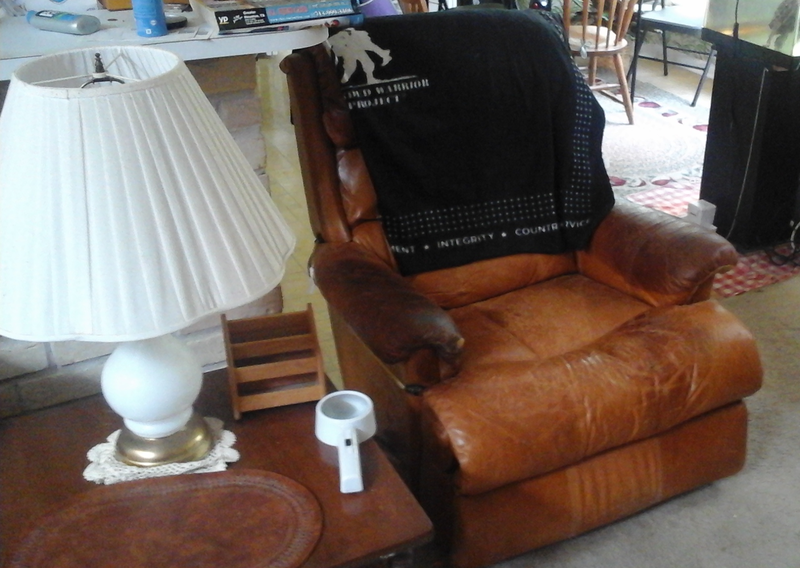 In a patriarchal way our entire family revolved around That Chair, even when we lived a thousand miles away. It's not that he sat there and hurled thunderbolts at anybody; he just had this constant, even, presupposition that all of us would do what he said and things would go the way he wanted them to. And he was usually correct about that. The interesting thing I learned when he passed away was that he meant more to me than I ever suspected. I always loved him in my self-centered way and I never doubted that he loved me. But I was much more like my mother. Our interests were much more the same, we were both highly intuitive people, it was easier for me to talk to her, and we both liked staying up late into the night watching TV. My father was far more business-like, more strictly logical, wasn't the most talkative person in the world, went to bed at 9:00 on the dot, and seemed to gain his greatest satisfaction from playing a good round of golf. My brothers loved golf too but I could never get into it, although I tried (a little). They had this camaraderie with him from playing countless games on the golf course that I did not. He tried to reach out, reading Discover magazine and watching the Science Channel so he could talk about my nerdy interests. And I did get to spend more time with him when he was experiencing his final illnesses. But I always assumed that my mother's death would have the biggest impact on me. And her passing did hurt excruciatingly. Dad asked me to give a "spiritual eulogy" at her funeral and it was so hard to get through. I had to do the same thing at my dad's funeral and I remember thinking, "Well, at least this won't be as hard as mom's eulogy was." But it was at my father's funeral that I broke down. I barely made it through. I honestly didn't expect the emotion that welled up as I talked about him. Since then there have been several times when waves of sadness, of missing him being in That Chair have hit me out of nowhere. Sometimes with no connection at all to what I'm actually doing. My belief is that to deal with grief I need to embrace it and let it happen. So when these waves hit I try to let them flow and just observe what is happening inside me. Over time this has decreased. I don't think I've had a sudden onrush of emotion like that in months. But tomorrow will be Father's Day with the Empty Chair. It will be an interesting test. I understand how you think you related better with Mom, we all did. But take a look at what you just wrote and then look at "My Beliefs" by Dad. Except for a few specifics they sound like they could've been written by the same person. You've got a lot more of Dad in you than you give yourself credit for, we all do. That is your house and your chair. You should try to enjoy it; the Dadness and the chair.